In this example, before applying IFERROR, you can see all the errors because of dividing by 0 for days that are not open. Let’s say for a report to your manager, you may have cleaner output. Instead of showing “#DIV/0”, you want to show “n/a” as the data point is not available. The best way is to use the “IFERROR” formula to detect an error, and substitute the error with a your desired message. And this will be the desired result. This is the desired result. Where a cell shows “n/a” in the event there is an error. But what if you have a lot of different formulas or tables where you want to apply IFERROR and do not want to do it manually? Below is a VBA macro that will do exactly that. This is a huge time saver for large, complex spreadsheets. The actual part of the script that modifies the cell and wrap the “IFERROR” around appropriate formulas. 'Debug.Print "Apply" &  "=IFERROR(" & Right(c.Formula, Len(c.Formula) - 1) & ")"
Below is the end result. Hope you enjoy it. Result of running the script on the selected areas. 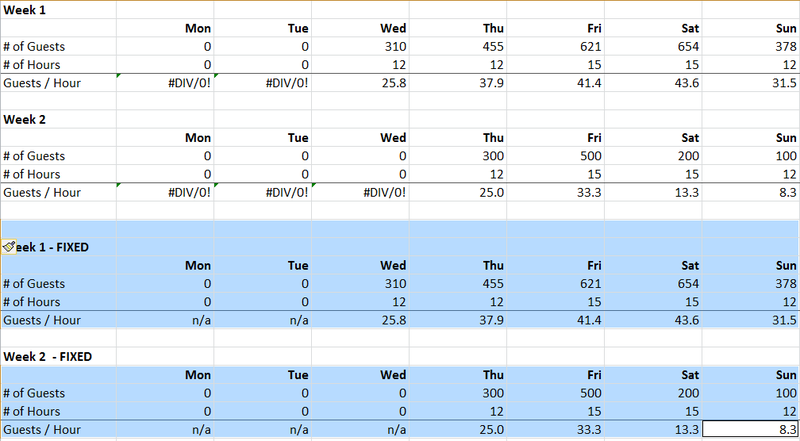 Formula view shows that only cells with real formulas have IFERROR applied to it by the script above.